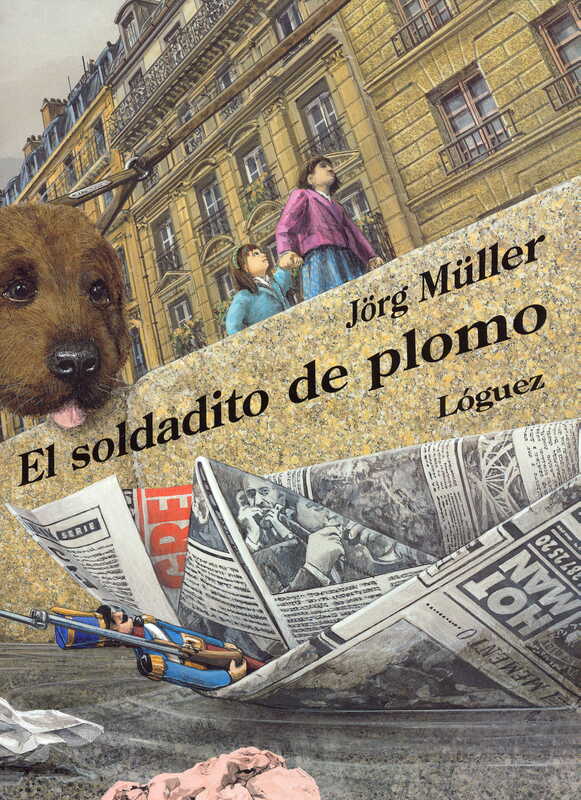 Jörg Müller, brilliant Swiss illustrator, uses this story as a starting point to create this unusual picture book with no words. The artist wants his drawings to be “read” carefully. Numerous details contained in the drawings show us the way and children result encouraged to wonder about them and to make up their own story, their own tale. “… a critical view on our opulent society … This picture book has hyper realistic images, with a photograph-quality and a narrative power strong enough to make words needless… Brilliant.” (CLIJ, February 2006). “… the ability to draw between the lines, with so many details that allow so many readings, and so many stories…” (Pepe García Oliva in BLOC, #0, 2007). As Potato Eaters’ author did, Müller shows his concern about the weak ones by highlighting the contrast between wasteful spending and extreme poverty. Inventions and true facts are woven in his pictures to express the wish for a better world. However, reality comes, and its disillusion. Reality is so unbearable that is better to tell as a story.” (José Luis Polanco in Peonza, # 97). Big Grey is a brilliantly narrated and illustrated story that takes place in beautiful landscapes and scenes with an impressive plasticity, starting from the flight of the two rabbits that are the main characters. However, living free, which is so necessary for Little Brown, becomes a torture for Big Grey. Stunned by a world he is not accustomed to, the world of freedom, he asks her runaway fellow to go back to the rabbits factory, back to the cage, where he will have all he needs. He will wait there for the men to take him, soon, to the White Guardians Country, a place nobody has ever come back from and nobody knows where it is. "… a beautiful and disturbing work, over which a sharp criticism and an intelligent parable about freedom are woven” (Gustavo Puerta in El Cultural de El Mundo). “There are some factories where chocolate is made, and they are called chocolate factories. There are some factories where cannons are made, cannon factories. But the one this is about is a rabbits factory. It does not have tall chimneys and it is barely noisy. This is how this book begins, written by a great author and with a great illustrator. Both of them have been awarded worldwide. The first of them surprises us with an emphatic text, a sometimes tender, sometimes thrilling text. The second one does it with a work full of a raw realism, with an extensive use of perspective” (Félix Albo in La Biblioteca de los Elefantes).